Thanx your study confirms that my rule of equity>1200 makes a lot of sense. This is the reason I trade with more than 3k , clearly I dont' think to live with the profits, but at least I can show to colleagues and investors that I trust my strategy and it isnt' just a forward test with the minimum tradesize. This is very interesting and leaves me with a couple of more possibilities to test out. To be honest, I don’t think it will leave me with much of an actionable result, but it will be interesting to see. Why "1200"? Why not 1,000 or 1,500? It seems rather specific. It is a parameter like the others, the initial value was 2000 . By the way we are going a little off topic, "relistic expectations" isnt' "how to fiter for good darwins"
For example at the beginning I was trading with 500 and was a forward test, like now I am trading 400 on CVL . I think it is not exactly conclusive - but it seems to be clear there is some kind of correlation. example there are 4.3% of darwins in profit today with more then 2 years and account over 500$ and with VaR bellow 20%. 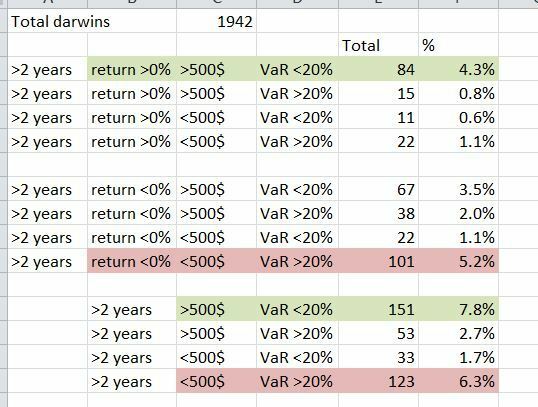 So, to be clear, the 7.8% that is in the last column ">2years >500$ VAR<20% 151 7.8%" is not the average gain for all the 151 darwins in 2 year? for the first in two year the average result is 8.58% for the second 14.92% ! so VAR is important but also the committment of the trader using his own money. your 1) are 7.9% of all darwins, ( 154) and 2) are 2% (39) of all darwins. I really really like this statistic, but I have a question about how you came to it. Is your percentage based on total Darwins? I have run the same test and came up with different percentages. I took the total profitable Darwins for that time frame and compared it to the total number of Darwins within that timeframe. For example, as of today, there are 510 profitable Darwins with a history less than 365 days and there are 1,086 with a total history of less than 365 days. Therefore, the percentage profitable is ~47%. Furthermore, with at least 3 years I found there are 40 profitable Darwins (basically the same as you) and 104 total Darwins showing more than 3 years of data - putting that number at ~39% of them are profitable. Therefore, it looks to me like you may have compared all of them to the total available Darwins. That doesn't quite seem like an accurate measure to me, but I am sure that I am missing something. I'd love to know more about how you came to your conclusion - because it is an amazing thing to see. yes % of all darwins, that is what make sense for me, although i understand your point and it have all logic also, but not on my "idea" of trading and invest...! in over 3 years % that come of profitable is based on 2Y return ( darwinex maximum presented) darwins consistently profitable with long track-record, are not many as with less then 1Y, being profitable in 6M / 1Y is not very complicated... but be profitable after 3Y start to mean something... this is in reality how "bigger" investors see it. Ah okay. Now I see where you are going with that. Thanks for the clarification. Backtest of "most investors" filter. Consistent with the study on equity by @JJENSLOPFAM , 7% annual. This is biased! Investors "invest" when a darwin is going well and so a backtest will tell us what we already know.